SNAPCHAT WILL LAUNCH a new feature that will allow multiple users to share photos and videos of an event they’re attending, creating a curated feed. Called Our Story, the feature will allow people who are attending the same event upload photos and videos into a central story. 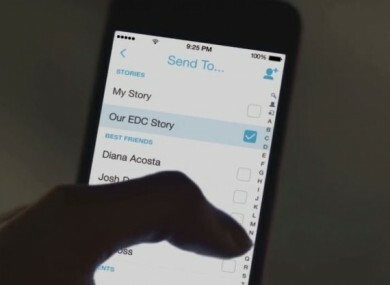 The feature is similar to ‘My Story’ which Snapchat introduced back in October. While ‘My Story’ strings together a number of photos and videos from the one person to create a narrative, this brings together photos and videos from people who mightn’t necessarily be friends on the service. The feature will be location sensitive, meaning you will have to activate location services if you wish to use Our Story, but Snapchat says it won’t store your location if you do. For now, it’s limited to just one event, the Electric Daisy Carnival (EDCLive), an electronic music festival which is taking place in Las Vegas. Email “Snapchat's next feature will let users publicly share photos at events”. Feedback on “Snapchat's next feature will let users publicly share photos at events”.